Install the Copado Change Management Integrations package, please check out the article Copado Change Management Integrations to get the links. There is one for sandbox orgs and one for Production/Developer orgs. You can choose to install for admins only (recommended option) or for specific profiles. 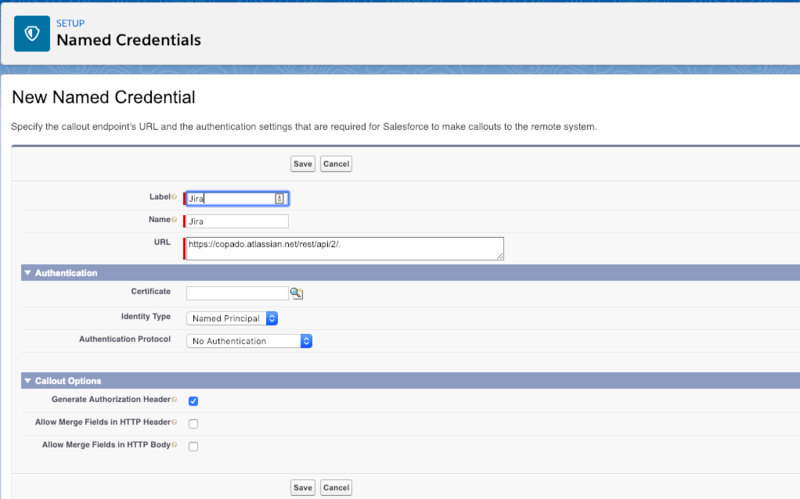 Identify Type: Named Principal - this means that one user will provide the authentication for all callouts from Salesforce to the external application. Authentication Protocol: Password Authentication - username and password will be required to provide the authentication for the named credential. Check your username. Depending on your organization's configuration, your username can have an email format such as John.Doe@company.com or a non-email format like john.doe. Go to SFDC Setup > Object Manager > Project. Edit the object layout - (if there is none yet, it may be a good idea to create a new page layout which you can use as the default page layout). Add the Callout Logs related list. Make sure you add the FLS and OLS access to the corresponding profiles or permission within your organization. Name: Enter the desired Name (e.g. Copado <> Jira). Named Credential: Enter exactly the same name as the Named Credential record created in step #2 (please note that it is the API name and not the label). Go to the corresponding Project record. If there’s none, create a new one. Update the Copado Integration Setting lookup field with the Copado Integration Settings record created in the previous step (#4). Project External Id: Corresponding Jira Project Id value, which can be obtained from Jira by going to Project Settings > here the key should be displayed. Configure the Field Mapping object by doing an insert upload of the default mapping file Jira_Default_Field_Mapping.csv which can be found in the Git repository. Insert can be done by means of any of the Salesforce data upload tools such as data loader or metadata inspector. Before importing the file, you need to enter the corresponding Project__c record id in the CSV file. Append rest/api/latest/field/ to your URL and you’ll get a JSON that describes all the fields of your Jira implementation (example with Copado’s Jira account: https://copado.atlassian.net/rest/api/latest/field/). Copy the content and paste it in a JSON formatter tool like https://jsonformatter.curiousconcept.com/. Get the custom field name from the "key:" attribute. You can use that value to create new records in the Field Mapping object. You can schedule an Apex job to retrieve the user stories from Jira based on your preferred frequency. The new class ScheduleUserStoryFetch has been created to perform a bulk import of User Story records from the external provider to Salesforce. Depending on the configuration of its cron expression, it will carry out the bulk operation periodically. It will retrieve all the mapped fields and will update the Salesforce fields with the external data. Sample on how to schedule the fetch process can be found in the Readme file in the Git repository. A process builder flow called SendUpdatedValues2TP has been created to update changes in user stories on the external provider. It is executed every time a change in a user story is detected and will send the modified fields to the external object fields. You can change the criteria of this process builder to update it to your needs/process. You can check for errors in Salesforce Setup > Apex Jobs. Errors are most likely related to the named credential. It is most likely that the Named Credential name in the Integration Settings record is not an exact match of the Named Credential that you set up. Make sure that the API name and the name of the credential in the settings are the same. Re-enter the password and make sure it is correct. If both Apex jobs are successful but no user stories are inserted into the Copado Project, put a debug trace on the user running the sync (Salesforce Setup > Debug Logs. Using the dev console debug level is fine). Review the logs as these can give you an idea of what is causing the records to fail on insert.